Issue No. 127 (November 2017) of the Glastonbury Review has just been published. The previous issue was published in 2015, but after a gap necessitated by the changes consequent upon the resumption of the independence of the British Orthodox Church, we are happy to resume publication. 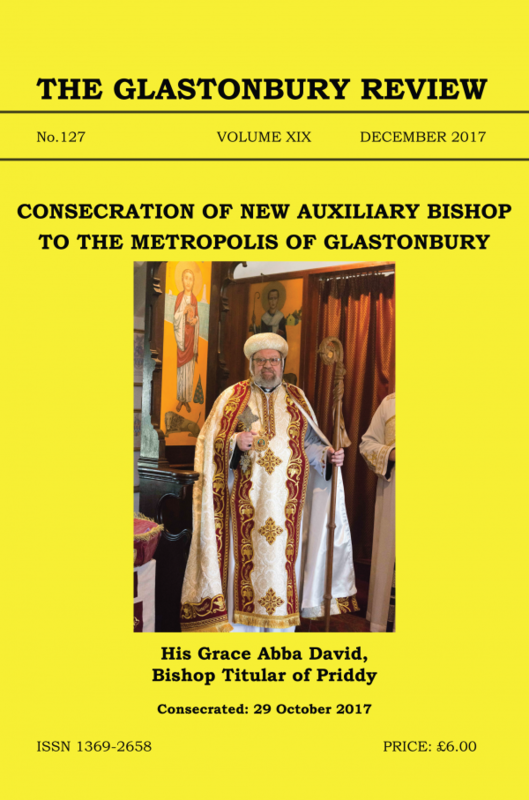 The front and back covers carry colour photographs of the recent consecration of Abba David as an Auxiliary to the See of Glastonbury, as well as detailed reports inside. The front and back covers contain coloured photographs of the recent consecration of Abba David as Auxiliary to the See of Glastonbury as well as detailed reports inside. The editorial (“The Same Journey, but different paths”) outlines the changes in our canonical position and our vision for the future and there is quite an extensive “Here, There & Everywhere” section chronicling key items of news since the last issue and reports in the Oriental Orthodox Church News section. Among the articles is one on the Sprotbrough Anchoresses by Father Alexis Raphael; a report of visits to the monasteries between Asuit & Sohag by Lady Coke,; “Lewis Carroll in Holy Russia” and a new feature, “Abba Seraphim’s Question Box” based on recent correspondence. The Book Review section has a number of interesting new publications, whilst the obituaries include the late Tasoni Effa, Metropolitan Kyrillos of Milan and Bishop Geoffrey Rowell.